Inside 101 More Interventions in Family Therapy, you'll discover many revolutionary and flexible strategies for family counseling intervention that you can tailor, amend, and apply in your own practice. 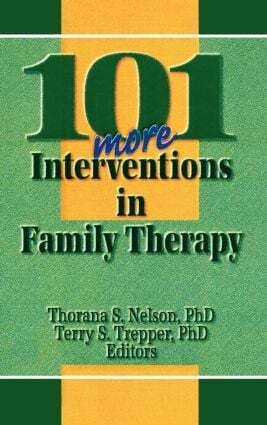 Designed to appeal to professionals of beginning, intermediate, or advanced level status, 101 More Interventions in Family Therapy caters to an even broader range of ethnic, racial, gender, and class contexts than did its well-received predecessor, 101 Interventions in Family Therapy. You'll also find that this volume encompasses a wider variety of family therapy orientations, including strategic, behavioral, family of origin, solution-focused, and narrative. On a Scale From One to Ten . . .
Race in Family Therapy: Unnoticeable or Relevant?